"This is a great snack or cereal. On cold winter mornings, pour on a little milk and heat in the microwave for a warm and comforting breakfast." 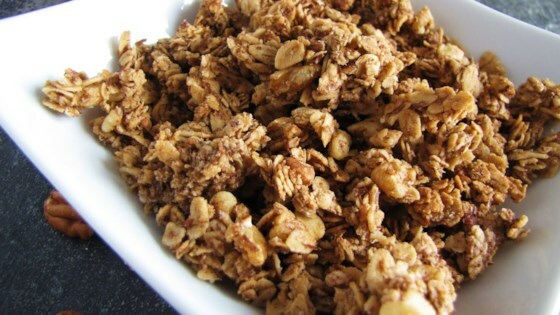 Mix oats, pecans, walnuts, flax seed, and cinnamon in a large bowl. Stir canola oil, maple syrup, maple flavoring, and salt together in a small bowl; pour over the oat mixture and stir to coat evenly. Spread the resulting mixture evenly onto the prepared baking sheet. Bake in the preheated oven until lightly browned, about 40 minutes. Set granola aside to cool completely before breaking into chunks. Store in an air-tight container. Used whole flax seed and added 1/2c of wheat germ as well. Yummy in my yogurt! I skipped the flax seed and used 1/2 tsp almond extract and 1/2 tsp vanilla in place of the maple flavoring. I used sugar free syrup. Turned out well.